Listening to: a screener copy of The Martian so there’s a high background-level of competence. * For the sake of clarity, not me. At the coffee shop this morning triaging email, I couldn’t help* overhearing a conversation that was going on not just at the table next to me, but *two tables over*. The conversation neatly fitted, I think, into the burgeoning genre of “horrific coffeeshop pitch reality documentary” and went a little bit like this. – but there’s more! The scavenger hunt app isn’t just an app, it’s a *platform*. And that platform isn’t just a scavenger hunt platform, it’s a *communications platform*. – because once something’s a communications platform, you can, um, do communications on it. Like “send Amber alerts” and “job offers” and all kinds of stuff. – in fact, it’s more than a communciations platform. They’re calling it a “content delivery platform,” which I have to admit is super smart because *everything* is content these days and content *does* need delivering, and if you don’t put content on a platform there’s a chance it could be super unstable and fall over and make a mess on the floor, so you better make sure it’s on a Supported Platform. – for completeness, let’s make sure that this content delivery platform is also saas because a) saas is like sassy and also b) like sass and who doesn’t like that? I am, of course, allowed to make fun of all of this because about eight years ago I was having the exact same conversations only they made *even less sense than they do now* because hardly anyone had smartphones back then and the internet was still just a thing that would happen in the future. If you want to know where this might be going, you should probably have a think about what Niantic Labs have been doing because I feel like whatever problems I might have had with Ingress (namely: b-grade plot, trope-ridden narrative and game world that works for a small/niche audience but could be much bigger, interesting funding opportunities given their original backer), they’ve got a much better chance at building something truly pervasive, ambient and location-based with their Pokemon joint-venture. In other words: I think no-one’s succeeded yet at making something that’s playful and that is location *aware*, rather than location *based*. Clue: one of these is more passive than the other. * obviously I could help, and a better person than me would’ve kept this all to himself, but at the same time I am not a better person than me, I am simply just me. Netflix continue to confuse me with their weird-what-is-it “Make It” sort-of campaign which most recently has made some Netflix Socks and initially got some attention by coming out with the Netflix-and-Chill-switch. The, er, “things” are variously a set of “maker” tribe-y instructions to hack together a piece of Netflix-related functionality. First, a switch that “dims the lights, silences incoming calls, orders takeout, and turns on Netflix”. The socks are described as something that will “detect when you’ve dozed off and send a signal to your TV, automatically pausing your show. Never again will you binge-watch yourself to sleep, only to wake up two seasons later wondering what happened”. A few observations: these aren’t necessarily *complicated* projects, but they involve soldering, buying a bunch of components and doing some coding. If you’ve done this sort of thing before, maybe they’d each take around a day to put together and get working? So my assumption is that *not many people will actually do these things*. The value, then, is in the signal that the projects send, not in getting people do the projects. I still don’t understand the point of this. Is it advertising? Not really. What’s it trying to say? of which, sure, ok, that’s a good way to talk about the benefits of Netflix albeit in a relatively round-about kind of way. Let’s think bold and create things. of which, I literally have *no idea what this has to do with Netflix*, which last I checked was the equivalent of an online tv and movie network. Our Netflix socks are inspired by ideas from Netflix users. If you have an idea about what could make the Netflix experience truly amazing, tell us all about it below. b) give up in terms of command-and-control and hierarchies and instead adopt some sort of looser, holocratic, self-organizing cell-ish organization based around accepting that information is always coming in, isn’t perfect, everything is adapting to defer/empower decision making to those with the skills and the interest. I say this as someone who – through my current work with Californian state government – is figuring out how you move not just *an* organization, but multiple organizations, from a culture that’s *over there* to one that’s *over here*. Example: one of the teams that I’m working with has never been able to use something like Google Docs before, so their traditional method of collaborating on a document is everyone sitting in a conference room and projecting a Word document, in Word, up onto the wall and people reading through it together. You know, the kind of digital document equivalent of those giant maps-are-the-territory sandpits that the military would use to move troops and materiel around during stuff like World War II with those long sticks. That, but with a Word document projected onto a screen. But! You give them permission and the space to work with Google Docs and to use features like live collaboration and they’re *screaming* along. It’s practically revelatory to them, and I’m not saying that as some sort of hyperbole. So even pieces like Google Docs nee Writely, which are around 10 years(!) old now are still bits-of-the-future that aren’t evenly distributed yet. Wieden+Kennedy, the ad agency that I was working at, had only last year transitioned to your regular-old we-host-our-own-Exchange Server to, I think, Google Apps for Work/Enterprise/Whatever, and the usage of Google Docs was limited to that kind of consumerization of IT where technically, you really *weren’t supposed to use it* but how else were some people going to get their work done? Of course, the way that this happens is that things like Slack start eating organizations like that from the inside out, like some sort of necrotizing fasciitis, a productivity/self-organization infection that looks like it could be threatening and isn’t understood by the rest of the body, and may well be attacked by in-house white blood cells. Stock and Flow is a reference, as always, to Robin Sloan’s concept of Flow (the feed) and Stock (the durable, long-term stuff) from 2010. Seriously, how many Slacks are you people in right now? Right now I’m logged into three Slacks that probably count as professional and another three that count as social, never mind all the ones I’ve joined but have logged out of because who has the time to be in all these Slacks? 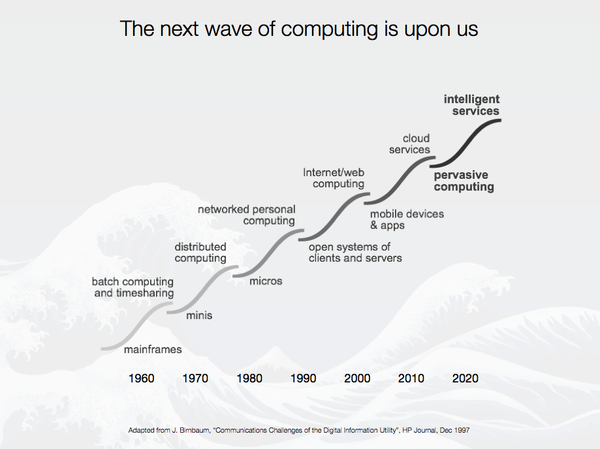 An image of the next wave of computing adapted from “Communications Challenges of the Digital Information Utility” from the HP Journal, December 1997, showing a series of evolutions in computing from 1960 to 2020, covering batch computing and timesharing/mainframes, distributed computing/minis, networked personal computing/microcomputers, internet/web computing/open systems of clients and servers, cloud services/mobile apps and devices and adding finally intelligent services/pervasive computing. I had one snarky, unhelpful reaction to this which was along the lines of technologists and people excited about technology (I explicitly include myself in this category) being simultaneously too excited about the potential of things and the speed at which change happens and of others to recognize the change too slowly when it does actually happen. In other words, that predicted change comes across both later than anticipated, but then when it does, it (feels like it) comes more quickly and all at once (when it is happening, and in retrospect). – ubiquity/portability of networked communications (some parts network access technologies, all the other parts the global internet super communications highway). In other words, the piece of internet-connected glass could do more, *different* things that paper does, more quickly. I was going to write something about Ben Evans’ 16 Mobile Theses today, but I think I’ve written enough. I’ll leave that for next time. I’ve also been thinking about the kind of teams you need to make prototype, usable user interfaces that de-emphasize screens in favour of other modes, which I’ll also leave here for next time. OK! 3pm. Send, as ever, notes. They are much appreciated!